Wash your fly mask periodically by spraying it with the hose. 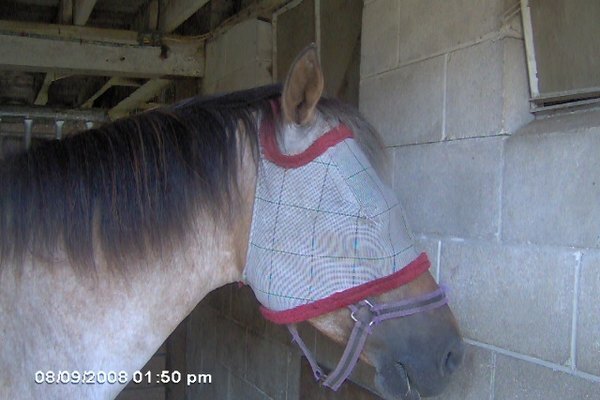 Using a fly mask to protect a horse's eyes from bothersome insects is important during those warm months. A fly can crawl around the eyes of numerous animals in your neighborhood as it can easily travel up to two miles a day. It picks up bacteria on its sticky feet from other animals, garbage, manure piles and rotting flesh and then crawls around your horse's eyes causing infections. You can usually purchase a horse mask at the local feed store but they aren't cheap and they tear before the summer is over. 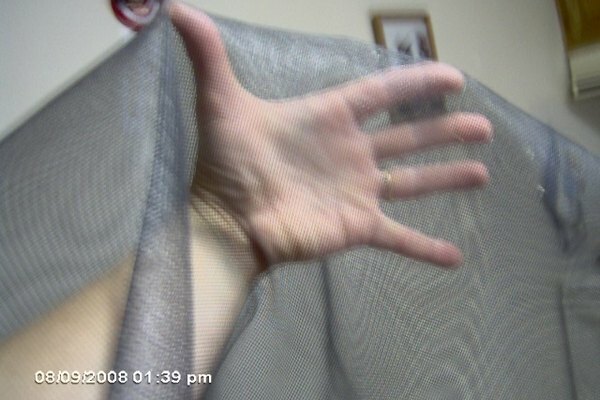 Purchase a fine mesh fabric. If you happen to have some black ground cover fabric, left over from your flowerbed or vegetable garden, it will work perfectly. If not, find a fabric will holes small enough to prevent flies from penetrating. You should also be able to see through the fabric when you hold it over your face. You'll also need about a 3-foot roll of Velcro with adhesive backing 1 to 2 inches wide. Use your horse's current halter for the frame, buy a new halter, or use about three-feet of thick fabric cut into strips about two-inches wide. Fleece remnants will work well. Gather your items along with a pair of scissors at your work area. Cut the mesh fabric so that it will fit between the nose section of the halter and the ear section. It should also fit from one side section to the other. 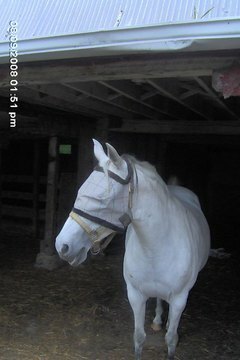 If you are not using a current halter, take a fabric measuring tape and measure the distance around your horse's nose. Then measure the distance around the horse's forehead to behind the ears and from the ears to the nosepiece. 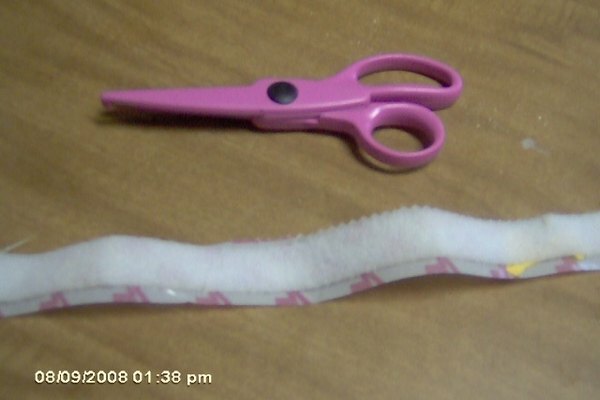 Cut your 2-inch wide strips of fleece into these lengths. Sew the ends together to circle the nose and to circle the ears and forehead. Also, sew two strips down the sides so that it is similar in construction to the halter pictured in this article. 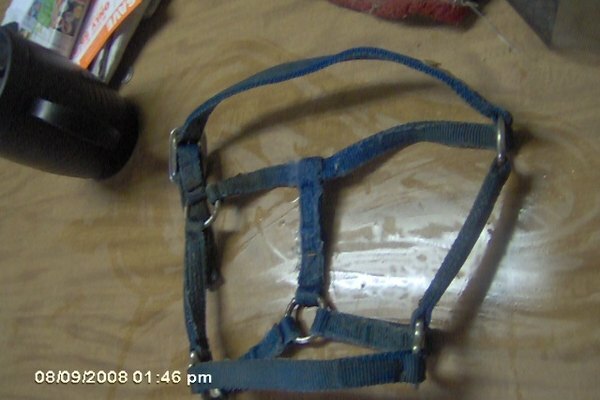 Attach the strips of self-adhesive Velcro to the sides of the halter, the top of the nose, and across the bridge of the forehead of the halter. Then attach strips of Velcro onto the mesh fabric in the same areas and attach it to the pre-made halter or the one you constructed. Put the new fly mask on your horse and protect your horse from insects.